Her name is Vani Hari a.k.a. 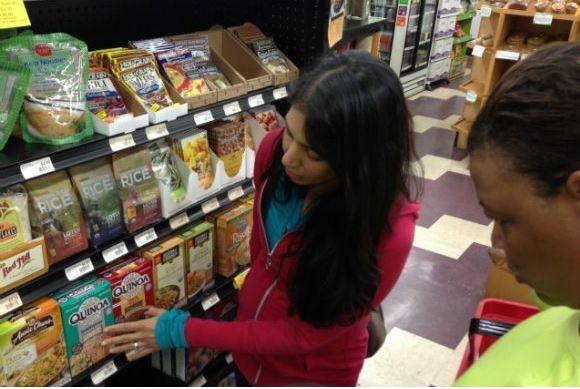 Food Babe and she has raised an army of followers with whom she fights the food industry. You can join her today and have a say on what can and should be used as ingredients in your supermarket products, your favorite subway sandwich, your so-called 100% organic products etc. Her latest investigative article “There Might Be Dead Animal Parts in Your V8! & Homemade V8 Juice Recipe” will raise the hair on your neck. Below is one of her appearances on CNN taking on the FDA about the massive amount of antibiotics found in meat which causes us to be antibiotic-resistant; something that is absolutely fatal. From meat in your 100% vegetable juice, wood pulp and cellulose in your snacks, to silly putty in your french fries and yoga mats in your Subway sandwich, she has investigated it all and has made the food giants like Kraft and General Mills confess and remove harmful ingredients. I can’t get enough of her videos and articles, not only because they are interesting but also because I am responsible for what I eat and what my children eat. Her slogan “Join Me! Investigate Your Food” says it all. You can do just that on this page. In case you’re new member of the Food Babe Army or just want a recap, here is a list of some of the big changes we have made in the food industry in just a short amount of time! This list is an amazing reminder to me of how powerful our collective voice has become. Keep it up Food Babe Army! Chick-fil-A Victory– After writing the piece “Chick-fil-a or Chemical-fil A” in 2011, Chick-fil-a invited me to their headquarters to discuss my concerns. After speaking with representatives at their headquarters, Chick-fil-a took my concerns and those shared by the Food Babe Army through facebook posts, calls to the headquarters, and boycotts of Chick-fil-a products and decided to improve the quality of their food. In 2013, Chick-fil-A responded to the heat to change by announcing they were removing artificial dyes, artificial corn syrup, and TBHQ from their products. Chick-fil-a also announced a plan to use antibiotic free chickens within the next 5 years – our #1 request to them! Chipotle Discloses Its Ingredients – After Chipotle refused to give me a full ingredient list for their menu items, I investigated the popular fast food chain. I found artificial ingredients, transfats and GMOs lurking in their “food with integrity.” The Food Babe Army responded by signing petitions, sharing the articles with their friends and putting pressure on Chipotle to be transparent. In March, 2013 as a result of our efforts, Chipotle published its full ingredient list on all menu items, including where Chipotle uses GMOs. Eventually, Chipotle also made the commitment to stop serving GMO food entirely. Kraft Finally Budges – It took over 380,000 signatures, countless TV interviews, and the loud voice of the Food Babe Army but we were able to force one of the largest food companies in the country to change. After hand delivering our petition for Kraft on April 1, 2013 which asked them to remove harmful dyes from their Mac and Cheese, Kraft responded by removing these harmful chemicals, which have been linked to hyperactivity, from their children’s products. General Mills Removes GMO’s in Cheerios – In November 2012, GMO Inside starting calling on consumers to put pressure on General Mills to make Cheerios without the use of genetically modified ingredients. The Food Babe Army played a huge role in signing the petition and making their voice heard. Over 25,000 people took part in the email actions and calls to the company. In January 2014, General Mills announced that they removed all GMOs from regular Cheerios by changing the use of GMO beet sugar to non-GMO cane sugar. A huge Food Babe victory! Subway Drops The Yoga Mat! – In June 2012, I released a ground breaking investigation into Subway ingredients. Subway refused to take our concerns seriously. As a result, in February of 2014, I started a petition asking Subway to remove a potentially harmful chemical, azodicarbonamide, from their bread. This chemical, which is also used in the production of yoga mats and the soles of shoes was definitely not something anyone looking to “eat fresh” should be consuming – especially since Subway was not using this ingredient for other countries. The Food Babe Army signed the petition, (we gathered more than 50,000 signatures in 24 hours), voiced our concerns on Subway’s Facebook page, and refused to consume their products until changes were made. In a mere 24 hours, Subway responded to us by agreeing to remove azodicarbonamide from their bread and completed this change by April of 2014. I am sure you are convinced after taking a look so for your health’s sake do consider joining up on this page. Have fun kicking some evil food industry behinds! ← 10 Signs Someone You Love Will Commit Suicide Soon! You are providing good service to the community; just wish people would more than note these things. Thanks for checking me out. You can also check out my older blog at emotanafricana.com. People like you is exactly what our society needs. Those who take in positive messages and spread them to others so that they can benefit too. Thank you Debbie! Great post. Thank you. This subject has been a preoccupation for me lately. Now I have another source to consult. Great! Happy to be able to add to your arsenal. I am an administrator of a group of 608 encouragers at the online group Trim Down Club, and growing every day. The lifestyle plan is a way of life. Changes have to be made. You have to start eating!!! People freak out when they the menu generated from a list of foods you love. You eat three meals a day and three snacks. It is sooooo healthy. This is not a commercial but a testimonial of important good health is to your future! You would never put tomato juice in the gas tank of your car. Processed foods and GMO’s , sugar and processed wheat is killing people in this country. Wake up and be here for your kids, and grandkids. Life is short.! Lovely and powerful comment. Thank you very much! I think we’re really at the point now where we can only trust in the food we grow ourselves and even then it is a minefield. I recently started a project to grow some of my own produce, I’m time, space, financial resource and weather limited. After researching materials for my raised beds I found how so many products can release toxins into the soil and settled for cedar wood which I then had to check was ethically sourced which was a nightmare, then I had to find the correct top soil and composts and fertilisers and pesticides and it led me on a really seriously long road to find pesticides I could make myself, organic fertilisers which when I looked into them were not what they seemed to be and in the end I feel I arrived at as near organic as I can get. Then I have to worry about watering the darn things, if there isn’t enough rain water then do I have to filter tap water, purify it? What do I do with the water? What about the rain water is it likely to have bad things in it? It’s crazy and never ending and hopefully campaigns like this will really make a difference. These companies can not continue to feed us rubbish. In the UK there has been a small but determined move back towards home cooking away from processed foods and a move away from large supermarkets back to local producers… I’ve certainly been making that shift myself and questioning more and more what I am eating and what I’m feeding my kids. Fantastic! I can say this for sure, you are definitely on the right path. Your story is quite motivating to me and to whoever reads about it. Thank you for taking the time to write such a great comment. I hope to hear a lot more from you. FYI: I nominated you for the "One Lovely Blog Award"!! Thank you, you always have really good comments and opinions. I am flattered to be nominated for an award. My only aim is to give people the tools that enable them to make the right choices in their lives. Being nominated by you is awesome though. Good post, I want to Reblog this with a link to your site. Thank you Ray I appreciate it. With people like you around there is a better chance for the message to get to the people.